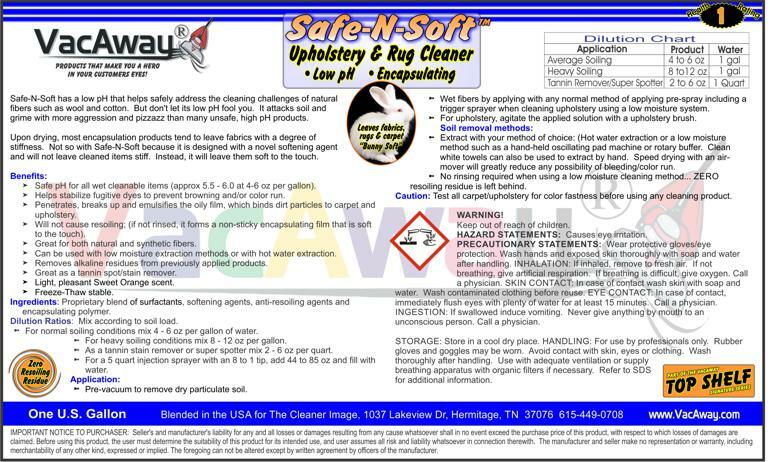 Safe-N-Soft has a low pH that helps safely address the cleaning challenges of natural fibers such as wool and cotton. But don't let its low pH fool you. It attacks soil and grime with more aggression and pizzazz than many unsafe, high pH products. Upon drying, most encapsulation products tend to leave fabrics with a degree of stiffness. Not so with Safe-N-Soft because it is designed with a novel softening agent and will not leave cleaned items stiff. Instead, it will leave them soft to the touch. From Danny Strickland of Crawfordville, Florida on 5/2/2018 . Cleans well, smells great. Steve and his staff are a cleaners best friend!!! From George&#39;s Carpet Cleaning of Riverside, New Jersey on 8/7/2017 . I agree with all the other reviews. This is another amazing product from VacAway. From Alan Trask of Saugus, California on 5/26/2017 . This is an amazing product on rugs customers have all said they look like new and are dry very quickly once cleaned. From daniel kite of fort wayne, Indiana on 12/31/2016 . Great product! I never imagined an encap product could leave such an amazingly soft hand. Tested on my personal rug, before putting it to work in the field, and my rug is softer than before cleaning and looks great. Another win from Vacaway!